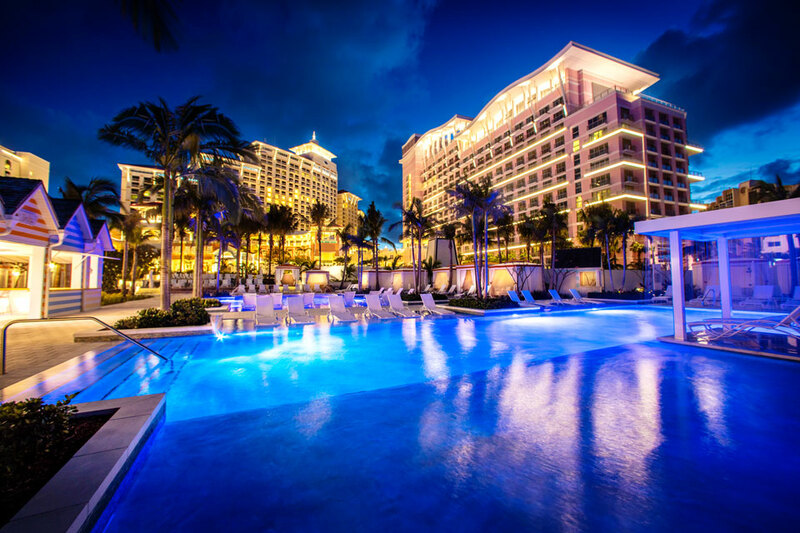 Baha Mar Luxury Resort Bahamas, what is it about? What does it take to have the vacation of your dreams? White sands? Maybe, luxury on an untold scale? A picturesque tropical setting? The Baha Mar may blow your mind with a world class vacation experience. Situated on a 1,000-acre expanse of beach property, the Baha Mar resort in Nassau, Bahamas is everything you could ask for in a tropical vacation. The resort offers three luxurious hotels with all the amenities to reflect true class. The hotel complex is a destination within a destination. You will find all you need within the 200,000 square foot convention space which has 30 luxury retailers (which include brands like Bulgari and Rolex), bars and clubs, spa with 24 treatment rooms, boutiques, and art galleries; the largest in Bahamas. Aerial view of Baha Mar Resort, Nassau, Bahamas. Photo credit Baha Mar Resorts. The luxury resort is located in Cable beach, Nassau, and is a towering figure; grandeur at its absolute finest. The mega resort is made up of three distinguished hotel brands, SLS Baha Mar, Grand Hyatt and Rosewood Hotels & Resorts. The resort was supposed to become operational in 2014, but was pushed back due to protracted financial and other issues. The complex was opened in phases with the Grand Hyatt being first in line to offer their unique hospitality. After many years of delays for different issues, the Baha Mar complex is now accepting guests. As it stands, the Grand Hyatt Baha Mar is inviting guest to try out the exciting new luxury hotel. The project took $4.2 billion to complete and had over 4,000 people working on it. For a long time, the Baha Mar seemed like an ill-advised mega investment that had turned against its owners. However, the resort has prevailed amid shifting tides. At one time the Chinese corporation running the project was in jeopardy of being declared bankrupt and the management changes that occurred also slowed things down. View of the pool at night at the Grand Hyatt, Nassau, Bahamas. Photo credit Baha Mar Resorts. After all the wrangling and elusive launching dates, the resort finally launched and has significantly improved the status quo in terms of tourism numbers. Said to be one of the largest hotels in North America, the resort has created 5,500 jobs. The Mega resort has given a well-deserved face-lift to the tourism sector in the area. The destination is spectacular for vacationing and a lot of different visitors are expected to come over and try out the majestic luxury resort. The mega resort has a worldwide appeal and seeks to improve the typical holidaymaker's experience in the Bahamas by the addition of vast gaming possibilities with a casino that matches global standards from Macau to Vegas and Madrid. The grand casino in the hotel complex is aimed at attracting visitors from China as it offers and equally riveting experience as Macau, which is known for its expansive wagering market. The accommodation here is expected to be world class as each room is lavishly and tastefully designed. The guestrooms and suites are spacious and each comes with a Juliet balcony or a full balcony. There are different types of rooms to choose from to suit all budgets. You can go for the standard guestroom or a view, deluxe, grand club, suit, villa or the expansive residences. Each type of guestroom is made with a certain theme in mind and the residences take the shape of a house complete with a kitchen and two or three bedrooms. The luxury hotel complex has a lot of room for vacationing folks. 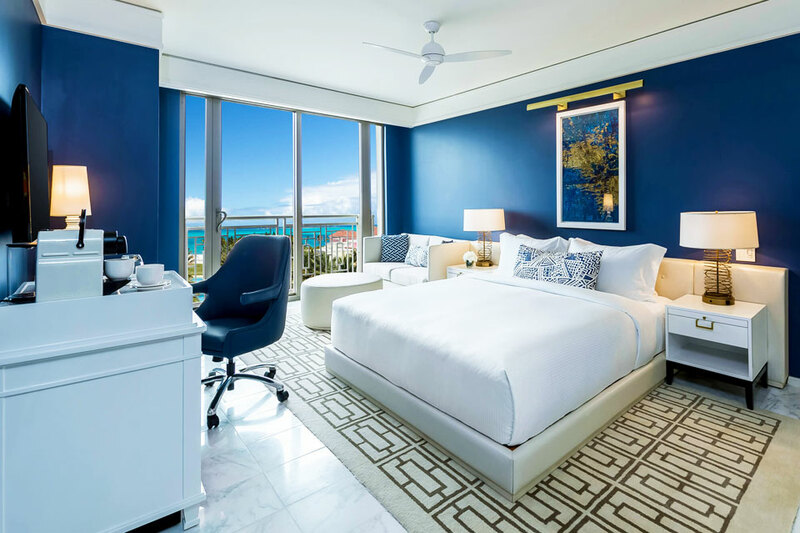 The Grand Hyatt has 1800 rooms, including 230 suites and residences; the SLS Baha Mar, carded to open in fall, has another 300 rooms including 107 residences and the Rosewood Baha Mar, scheduled to open in spring 2018, will have 185 ocean view rooms and suites, as well as five luxurious beachfront villas. Getting a room at the Baha Mar will set you back around $225, that's for a standard room at the Grand Hyatt Baha Mar. It will cost you $285 per day for a bed and breakfast package. We got these rates on the Grand Hyatt website using dates in early September. Remember prices may change. *Taken from the Grand Hyatt website using the standard rate of a Grand King guestroom. Modern elegance of the rooms at the Grand Hyatt, Nassau, Bahamas. Photo credit Baha Mar Resorts. *Taken from the SLS Baha Mar website using the standard rate of a Superior King guestroom. Stylish and Luxurious - the rooms at the SLS Baha Mar, Nassau, Bahamas. Photo credit Baha Mar Resorts. *Taken from the Rosewood Baha Mar website using the standard rate of a Ocean View King Room. Each of Rosewood’s rooms, suites, and villas offer butler service, as well as private outdoor living areas. Guests have a lot of splendid choices when it comes to fine dining. There are 20 different cuisines to choose from if you want to try anything for the first time. A lot of foreign cuisine is served, but so are local delicacies as well. All the appetizing global and local preparations are made by a team of internationally acclaimed chefs. The culinary tradition here is to explore and come up with new tastes and flavors so be ready to have a bit of the outlandish. Guests can enjoy some good food at any time as long as they want something. Twenty-four hour in-room dining services make this possible. In the evenings, guests can also enjoy cocktails in the sandy beaches from the island bar and also get some food while out enjoying the sun in the open-kitchen. The Bahamian sun is just perfect for a 10 o'clock tee time. The 18-hole, 72-par golf course is favored by the charming native landscape that offers some of the best golfing you can hope to play. The Royal Blue golf course has a stunning seascape of the turquoise waters of the ocean through the first nine holes. The second part of the golf course is lined with beautiful sights of the mangroves and Caribbean pines. The challenging course is not just about eye-caching views; it meanders through a series of moonscapes, water hazards and roughs that will challenge you to step up your game and make the rolling fairways even more enjoyable. A golf course of such a notable design should be used for more than just some friendly competition. 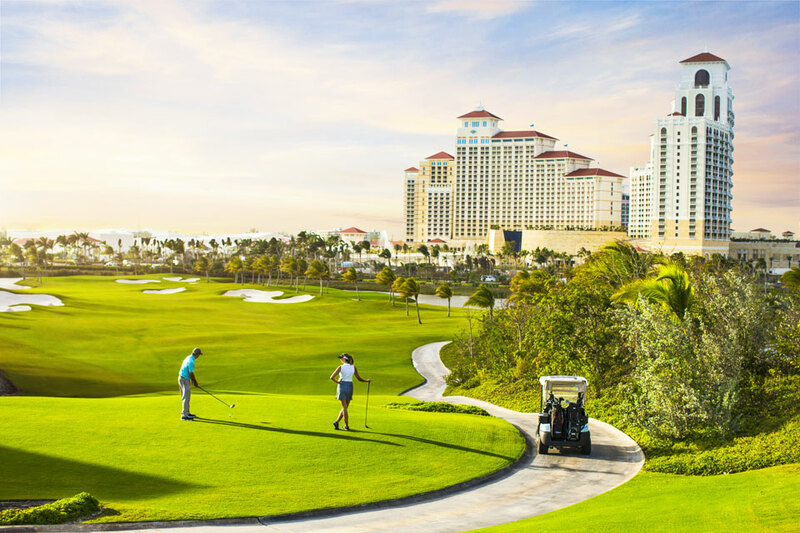 The Baha Mar is hoping that this golf course would be able to attract some professional action in the near future. The golf course was designed by golf legend, Jack Nicklaus a.k.a “The Golden Bear”. The forward-thinking course design makes for a thrilling contest after which you can refresh at the clubhouse and enjoy a sumptuous lunch. The Jack Nicklaus designed Royal Blue Golf Course. Photo credit Baha Mar Resorts. This world class casino is the biggest in Nassau. The impressive 1,000 square foot casino has floor-to-ceiling windows with a brilliant view of the ocean water by day; by night a light and fire show creates beautiful six-minute laser effect with cascading water walls projecting Bahamian cultural music. The casino floor's declamatory design provides for a high energy environment for some enthralling wagering. The casino is outfitted with all the latest slot games that Vegas is famous for. The first-rate range of slot games includes favorites like Wheel of Fortune, Stepper and Video Reels. With over 1,140 slot machines available on a 24 hours basis, there is never a dull moment in this casino. Casino aficionados who like to stake big on the tables have some 119 table games to go through. Among the 119 games, there are four types of blackjack, three types of Baccarat, Single and Double Zero Roulette and Craps. In the middle of the casino ceiling, the glitzy centerpiece seems to assert the grand nature of the largest casino in Bahamas. Some would say that this multi-million dollar casino has presented a worthy rival to Atlantis Paradise Island, but I think they cater for two different types of individuals and in fact Atlantis may even benefit from the success of the Baha Mar Casino. We visited Atlantis Bahamas Resort in 2013. Even though wagering games are not the most famous form of pastime around the Bahamas, this new casino is looking to change things. If you had the chance to, I bet you would drop everything to get to the beach and just enjoy the sand on your feet. The Baha Mar at Nassau encapsulates the ultimate beach experience. You can enjoy, fountain, island and ocean views that will steal your breath. The turquoise waters of the ocean are inviting under the glistening sun and you will also enjoy a look at the marine life down there. The Baha Mar is a water world of sorts with seven pools in total. Aside from the pools around the resort, there is a stretch of white sand beach to enjoy. A beach sanctuary also adds to the fun; children will particularly enjoy learning about the marine species in the live aquarium. Turquoise water surrounds the pier at Baha Mar, Nassau, Bahamas. Photo credit Baha Mar Resorts. Even though the luxury hotel has the finest that money can buy in terms of hospitality, it is counting on something other than that to make it more popular with visitors. Aside from the good time that guests are guaranteed to enjoy during their stay, they can also learn a lot about their destination. It is the resort's way of giving its visitors a fuller experience whenever they are there. The resort has an aviary where children can learn about indigenous butterflies and hummingbirds. The kids can also learn some basket weaving among other crafts with some lessons. When it comes to art, the resort also has its way of promoting authentic Bahamian art. Around the complex, there are some 8,500 pieces on display. These vary from sculptures to paintings, photographs and ceramics. The artistic pieces are spread all through the resorts expanse dotting it with splendid art forms. 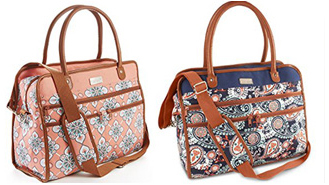 This is both for sporty people and those who just like to enjoy the great outdoors. As for the nature lovers, the picturesque environment sets the stage for enchanting nature walks. Enjoy the marine life of this Caribbean paradise with a scuba diving expedition. One day getaways are ideal in such a pristine environment. Honeymooners will enjoy this to bits. There are lush greens to explore around the complex and nearby that can make for a worthy afternoon excursion. Those who like to stay fit will find a fully equipped gym and tennis courts. The idea of playing tennis at the Baha Mar brings to mind the classic tennis court where titles are fought for. All the amenities are up to par and the racket club is waiting for guests to come and enjoy fun match-ups. Water sports also contribute to the fun. Guests can go kayaking. After enjoying the mouthwatering recipes from the restaurants that dot the complex, it’s time to have some fun with live music. The 11 bars around the complex serve a night life with a mix of everything, from party music to live events. Cocktail blends from the local scene will liven up the night. The late night bars ensure the party keeps going through the night if you don’t feel like quitting. The Baha Mar is probably difficult to put in words. You would have to see and experience all the amazing things that await you on your arrival. There is a place for everyone in your family, no one is left out. The accommodation is up there with the best on the island. The Baha Mar has the enchanting nature of a tropical heaven and the abundance afforded only to royals. Whether the big hospitality complex will live up to the lofty goals which the developers have set for it can only be speculated. One thing is sure though; the resort has matched the best in the world when it comes to lofty standards. There is a little taste of heaven in every single cut of grass or yard of sand at the Baha Mar. Go see for yourself! Photo Credit: Top: Baha Mar Casino by Baha Mar Resorts. Have you ever visited Baha Mar? Let us know what you thought about the resort.